I created an intention this morning ~ Today, I appreciate a kind heart! Meet Tom, who not only has a very kind heart but also sells something very sweet and tasty, namely ice cream. 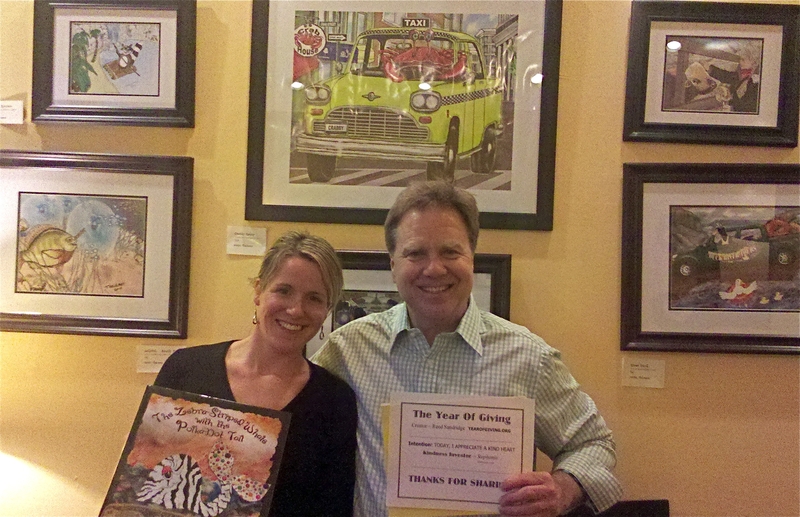 Tom and his wife Shari, opened The Zebra Striped-Whale in Newtown, PA several years after his wife self published her first book, which shares the same name. When I encountered Tom he was busy at work behind the counter but was still open to share his story before I even presented him the ten dollars. I learned he used to work for years in my town (small world) and that he is the father of two daughters, Maxine (Max) and Ariele, one of which who was having her first day of work at a law firm in Philly. The Zebra-Striped Whale is known for whirlwinds. A whirlwind invites you to choose your ice cream flavor and the toppings are blended into the ice cream by hand with a flat paddle. Tom was a psych major in college and worked in sales for most of his life. He shared his dream of opening an ice cream shop with his wife and the two took it to the next level. Tom is a creative spirit both on and off the job. He created the artwork for The Zebra Striped Whale Alphabet Book, which is soon to be published. Tom’s motto is create a nice life, live well, and share good fortune and happiness with others. Before we left, Tom surprised my friend Colleen and I by giving the $10 to her. She used it to buy “The Zebra-Striped Whale” and Tom also gave both of us a book called “Cop Buddy” that was created to honor a fallen officer. Tom and Shari not only own an ice cream shop and publish children’s books, but they also created The Zebra Striped Whale Foundation which serves the community through the art of children’s picture book publishing. He truly has a kind heart and I enjoyed meeting him. Hi Stephanie, it’s cool that you got to see someone do something with your gift on the spot! What was the double blessing is my friend Colleen was sooooo moved by the giving experience. She said she found herself nervous for me to “approach & talk” to a stranger. I however wasn’t feeling that myself and what she felt as an observor was the OPENESS 🙂 strangers had to connect, share stories, relate and then continue the giving. It moved Colleen so much to be part of it and that was a surprise to me. I didn’t realize how the experience was going to touch the observor (Colleen) so much in a very deep way! Very interesting read. Sounds like you are having fun!